Launched in Japan forty years ago, the VHS video tape recorder standard helped to revolutionise they way we watch TV worldwide. But despite twenty years of popularity, VHS tapes are seldom seem today. Developed by JVC, VHS found itself going head-to-head with Sony's Betamax in the early days (the so-called "Format War") plus a number of less well-known formats. VHS was cheaper and offered longer recording times, but Betamax had better picture quality and more compact cartddges. In the end VHS won and became de facto standard worldwide. 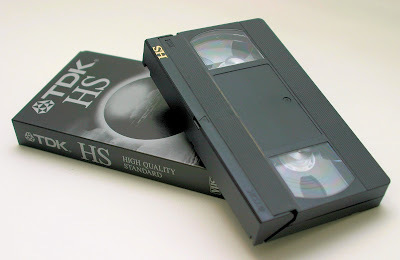 VHS had drawbacks though, often suffering from poor picture quality and the inconvenience of having to rewind the tape when you had finished.. and if you've ever rented a movie to find that the previous user hadn't bothered then you'll know how frustrating THAT was. The relative ease-of-use and cheapness of VHS meant that it remained popular until the later 1990s (with product continuing well into the 2000s), despite several attempts to popularise something better. In the end it took two devices, the DVD player and the DVR to finally kill off VHS. Today, even those devices are being threated by video-on-demand services such as Netflix and Amazon Prime. Even in the 1980s one of the main shortcomings of VHS was clear - the size of the tapes. The plastic case that movies came in typically measures 202 x 125 x 30mm or so which is essentially the size of a hardback book. Tape for home recording were a little smaller, but still bulky. Ten movies on VHS would require about a foot of shelf space to store, so if you enjoyed such things then you could soon run into problems with actually finding somewhere to put them. A single DVD package took up just half the space, and for things such as TV box sets you could easily put several episodes on one disk and squeeze two disks in one box without making it bigger. Modern BluRay packing is smaller still. Even then, DVD and BluRay storage can be a pain which is probably one of the reasons that digital distribution is growing in popularity. But what do you do with old VHS tapes? You can't even give them away these days, and they are generally not accepted for recycling, instead they are destined for landfill. Companies such as Terracycle in the UK offer paid solutions to recycle VHS tapes but the process is not cheap. In fact the whole issue is a nightmare for the environmentally conscious, but there are some more.. errr. creative solutions out there.